You don't often associate pancakes with Italian cooking but they do feature quite often, usually to replace pasta sheets in baked dishes. 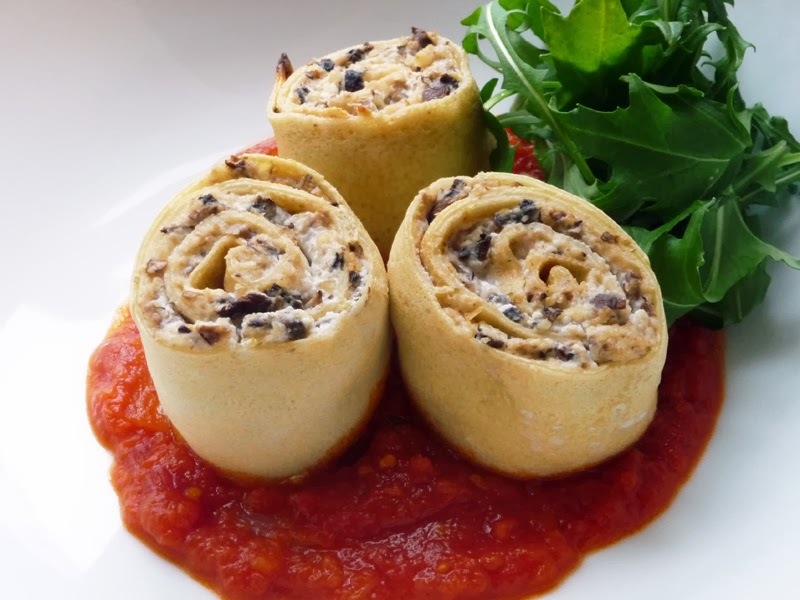 They are either laid flat and layered, like lasagne, rolled like cannelloni or you can fill, roll and cut them like these crespelle, arranging them in a dish for a prettier effect. If you fancy something a little more substantial than the classic lemon and sugar for Shrove Tuesday this year (4 March 2014) then why not give these a try? The recipe looks mega, but really they are quite easy to prepare. OXO, one of my favourite kitchen utensil designers, sent me over their new Flip & Fold Omelet Turner (also useful for pancakes) and Batter Dispenser. As expected, the turner is another winner. 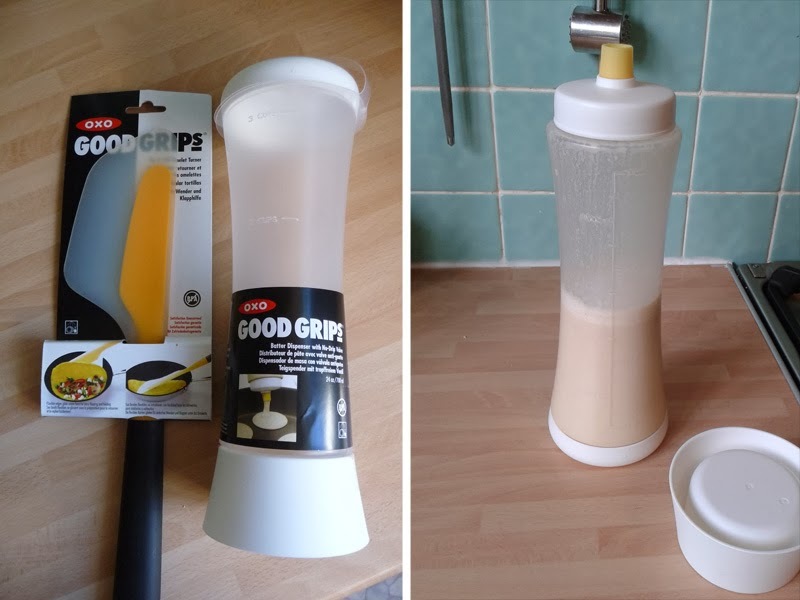 The super thin silicone edge glides seamlessly between the pan and pancake, yet grips on well, then the stiff yellow ridge is really supportive to turn things over easily. Although it looks large, it's actually super lightweight and a great design. I think the batter dispenser is better suited to small, thick American style pancakes, like the buckwheat, blueberry and banana oat ones that are a household staple here. Really handy for placing in the fridge full of prepared batter as it chills too. Make the crespelle batter. Sift the flour into a bowl and make a well in the centre. Add the eggs and beat with a fork. Gradually beat in the milk until you have a smooth batter. You may want to use a whisk at this point. Pop the batter in the fridge for 30 minutes. Meanwhile you can make the filling and the sauce. Roast the mushrooms. Arrange the prepared mushrooms on an ovenproof tray. Add a splash of red wine vinegar, the garlic cloves, thyme and season well. Give the tray a shake and roast in the oven for 20-30 minutes until browned. Remove and chop very finely with a knife or pulse in a processor or chopper until medium-fine. Make the tomato sauce. In a saucepan heat a tablespoon of olive oil. Add the onion and fry until translucent, making sure it does not brown. Add the tinned tomatoes, crushing them with the side of a wooded spoon to break up. Cook for 30 minutes until thick. Season and blend with a processor or stick blender until smooth. Set aside. Make the filling. Heat a little olive oil in a frying pan and add the bacon. Fry for a few minutes until the fat melts out and the bacon becomes crispy. Pulse the walnuts in a processor or chopper until fine, but not powdered. In a bowl place the ricotta, chopped mushrooms, grated Parmesan, grated lemon zest, walnuts and the fried bacon. Season well and combine thoroughly. Make the crespelle. Using a piece of kitchen paper, scantily coat the base of a large non-stick frying pan with a little olive oil. Pour in just enough batter to thinly coat the base of the pan and spread quickly by tilting the pan. Cook for a couple of minutes until golden. Turn and cook the other side. The batter should make eight crespelle, two of which you can lose to the crespelle Gods. On a clean surface, lay 3 crespelle in a line, overlapping the edges. Lay a second row underneath, again overlapping them so you have a rough rectangle overall. 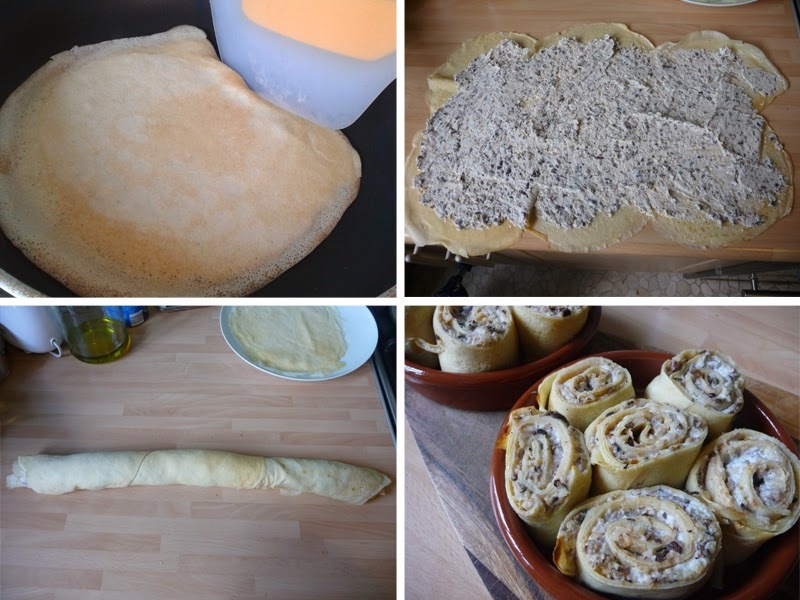 Spread the cheese and mushroom filling across all the crepelle, carefully roll from the long edge up. Cut the roll into inch thick pieces and arrange with the rolls facing up in an ovenproof dish. Place in the oven for 10-15 minutes until the edges start to brown and the crespelle are warmed through. Reheat the tomato sauce if needed. Serve. Place a few spoons of the tomato sauce on a warmed plate, arrange the crespelle with a handful of rocket leaves on top.